Let’s say you buy this idea that an increasing number of technologies are on an exponential curve (that is, they’re advancing at an accelerating pace) and whereas you might once have had decades to adapt, now you have a decade or less. Let’s say you agree with this information. What do you do with it? If you’re me, you buckle down and keep writing about all these amazing technologies—until a robo-writer does it better. But if you’re the smart guy or gal building that robo-writer, well, I’ve got a survey for you. Some of the results aren’t too surprising. 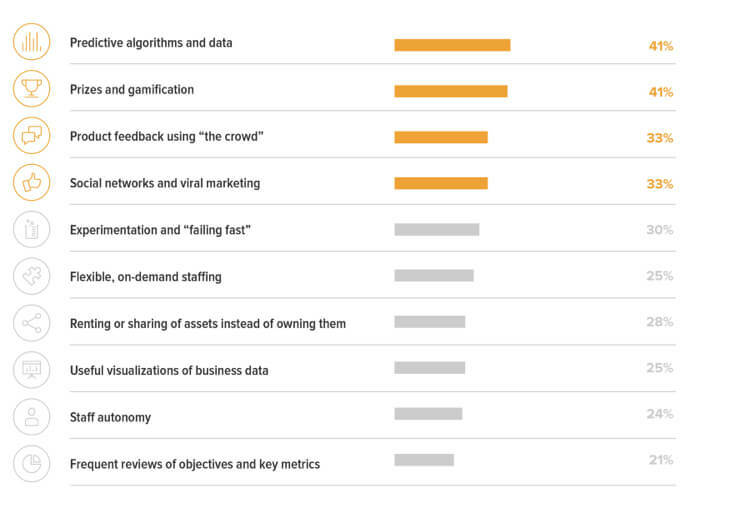 The survey’s 1,283 US-based executives, for example, chose experimentation and “failing fast” as the number one most important tool for disruptive innovation. This idea is as close to gospel as you get in tech circles—and its shadow is only growing longer as the days go by. Stewart Butterfield, CEO and cofounder of Slack, for example, has said his team was developing an online game when they built a chat system (on the side) to collaborate more efficiently. The game failed—the chat system, now known as Slack, is booming. Fail fast, experiment, don’t be afraid to switch course. Which three of the following tools or practices do you think are most important in creating disruptive innovation? 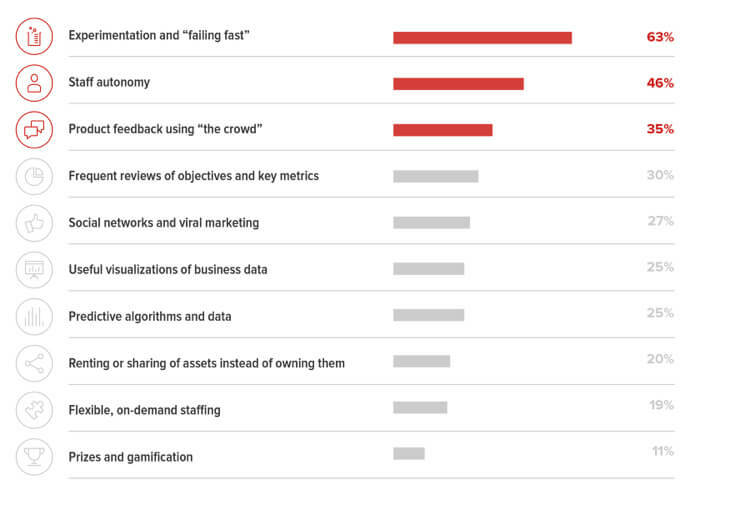 The second and third most important tools for disruptive innovation according to the survey were giving workers autonomy to pursue creative solutions and seeking product feedback from the crowd. It makes sense to adopt these tools like others are, but why stop there? To get an edge, you should ask what others aren’t doing yet. The tools being used least effectively (and ranked lower in importance) included predictive algorithms and data—think narrow AI and big data analysis—and prizes and gamification. Which three [disruptive innovation tools or practices] do you think are being used least effectively in your organization? Who, then, are today’s most revered disruptors and which leaders are in the wings? According to the survey, the young turks include Kickstarter’s Yancey Strickland, Uber’s Travis Kalanick, Airbnb’s Brian Chesky, and Crowdfunder’s Chance Barnett. 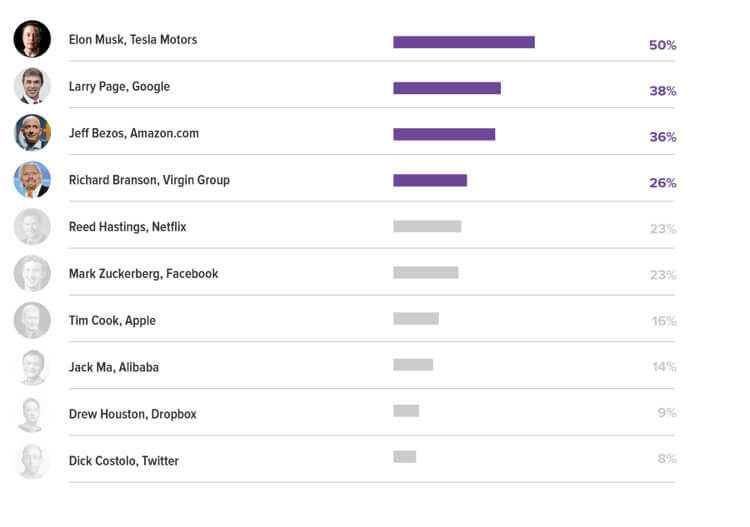 Meanwhile, the more established cohort includes Tesla and SpaceX’s Elon Musk (no surprise there), Google’s Larry Page, and Amazon’s Jeff Bezos. Chris Anderson (TED), Salman Khan (Khan Academy), Joanne Liu (Doctors Without Borders), Sue Desmond-Hellmann (Bill & Melinda Gates Foundation) were the top leaders of disruptive non-profits. But let’s say you’ve got the tools covered and you’ve read the bios of the biggest names out there—what you really want to know (and let’s face it, this is the fun bit) is what new technology is going to be the biggest disruptor in the next few years. What should you put your hours, brains, and dollars behind? Which of the following technologies do you think will have the most disruptive impact on business in the next three years? 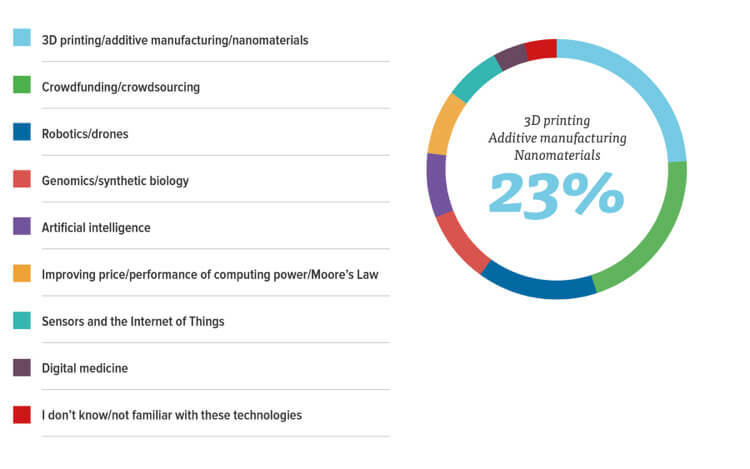 The survey says: 3D printing, additive manufacturing, and nanomaterials. Especially in industrial settings, computer aided additive manufacturing (plus, perhaps, subtractive manufacturing) will be used to make beautifully complicated items using fewer parts and further turbo-charge design and prototyping. Robots (third in the list) are already in factories, but they’re fast becoming more flexible, easier to use, and able to perform a wider variety of tasks. And drones too are making an impact. Depending on future regulation, they may make their way into construction, media, retail, and agriculture, to name a few. Artificial intelligence, genomics, and synthetic biology scored lower. And that’s probably about right. These are coming, but they may take a little longer than three years to be truly disruptive. Really, though, I’d like to do a survey of the survey. To our forward-thinking readership: What are the most critical tools for disruptive innovation, who’s doing it best right now, and what technology will be most disruptive in the next three years?